Stress and overwork have affected Sherlock Holmes’ iron constitution, so both he and Dr Watson are enjoying a holiday in Cornwall. Holmes, naturally enough, abhors inactivity and is keen to seize on any distraction – so when the vicar (John Glyn-Jones) bursts into their cottage early one morning with a tale of death and madness, he’s immediately interested. Three members of the Tregennis family have been struck down in a most inexplicable way – the sister is dead whilst the two brothers have been driven quite mad. There is a fourth Tregennis sibling, Mortimer (Patrick Troughton), who was present with them the previous evening, but he insists that when he left all was well. Holmes and Watson risk their own sanity to solve this devilish puzzle …. Originally published in 1910, The Devil’s Foot was one of Conan-Doyle’s favourite Sherlock Holmes stories (he ranked it ninth out of twelve favourites). With a very limited number of suspects it’s not really a whodunnit, rather it’s a howtheydunnit. Famously when the script was delivered, it was found to be dramatically under-running, so both Douglas Wilmer and Nigel Stock intensively worked on it and were able to bring it up to correct length. This is mentioned in the BFI booklet, so there must be some credence to the story, but it’s hard to understand why the actors had to do this (rather than script-editor Anthony Read). Douglas Wilmer does give his opinion about what Anthony Read was doing at the time (via the highly entertaining commentary track). I won’t reveal what he says, but it’s not terribly complimentary! The comm track on this episode is a must listen as though Wilmer is 95, he’s still as sharp as a tack. Although his dissatisfaction with some parts of the series was well known (and this was the reason why he didn’t do a second series) I wasn’t quite aware just how unhappy he was. He seems to have had problems with the producer, some of the directors (who he considered to be far too inexperienced) as well as several of the adaptations. Overall, he doesn’t seem to have enjoyed himself at all – which is a pity, partly because it’s still an impressive series (despite whatever was happening behind-the-scenes) but also because it’s the programme he’s best remembered for. But although making the series wasn’t always a happy one for him, he’s still got a sharp sense of humour and this helps to stop the commentary track from simply being a long list of complaints. The story benefits from location filming in Cornwall (the jagged cliffs and stormy seas are particularly photogenic). It’s just a shame that the original film sequences no longer exist (as the telecine process tends to make the images rather murky). There’s a remarkable performance from John Glyn-Jones as the vicar. I can’t decide whether he’s playing his initial scenes (where he describes the horror of the Tregennis house) for laughs or if he’s simply overplaying to a ridiculous degree. 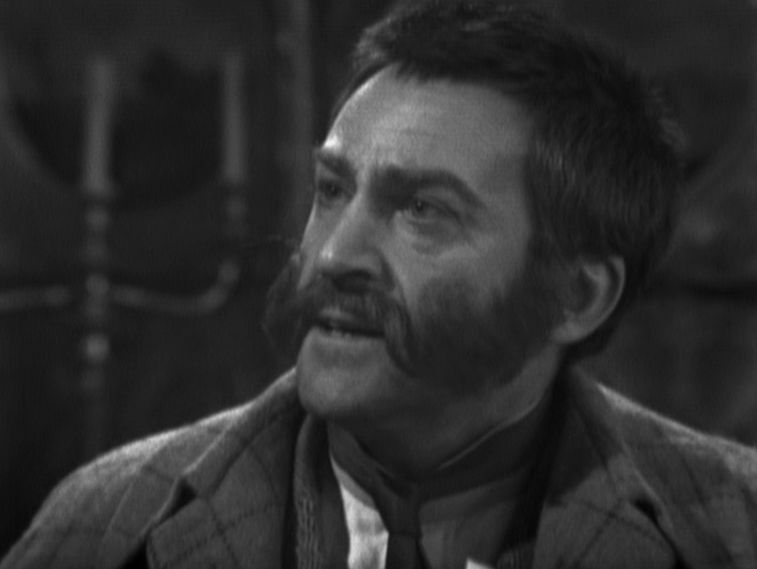 Much more assured is Patrick Troughton as Mortimer Tregennis. It’s always a pleasure to see Troughton and whilst it’s a fairly low-key part, Troughton’s class still shines through. His character is rather shifty and therefore appears to be a prime-suspect – so his death (in an identical fashion to his sister) mid-way through the story is a good twist. Suspicion then falls on Dr Sterndale (Carl Bernard) who has already clashed swords with Holmes earlier on. Holmes eventually divines the way the murders were carried out and elects to undertake an experiment to replicate the same effect. Watson is steadfast in accepting to stay with him and afterwards we see a very nice moment between Holmes and Watson (and Wilmer and Stock). If Wilmer’s Holmes is often rather detached and analytical (with not too much of the warmth and humour that some actors have brought to the part) then the aftermath of the experiment provides us with a telling scene. Holmes berates himself for risking both his and Watson’s life, although Watson tells him that “it is my greatest joy and privilege to help you.” Any Holmes/Watson relationship will only work if you believe that they enjoy a strong bond of friendship – if Holmes is too remote or Watson too stupid, then it’s difficult to fully invest in the characters. Some of Doyle’s stories, like this one, do feel slightly stretched when adapted for a fifty minute slot, but overall The Devil’s Foot is very decent fare – thanks to Troughton, the Cornish location and the continuing good work from Wilmer and Stock.